You are here: Home / Encouragement / What Will I Leave in My Wake? What Will I Leave in My Wake? As I sit here, there are watercraft running up and down the lake before me. Each boat or jet ski that passes creates a wake behind it. That wake becomes a small wave the originates from one small place, but casts its impact all the way to the waters edge some hundreds of yards away. Everything in the path of that wake moves on top of the water because of the impact of the wave. I can’t help but wonder what kind of wake my life and yours will leave. So many in our world are living for Number One and as long as it makes them happy or brings them satisfaction, money or power, then they consider it all right. It doesn’t matter who else is hurt or inconvenienced. In a harbor there are rules about how fast a watercraft can proceed because the wake can cause major damage to moored boats, as well as erosion and damage to the shore line. Just like on the water, in life there are rules and one is expected to take others into consideration before acting. This is especially true for leaders and those in authority. Here are some questions you might want to ask yourself. *Do I take other people into consideration when it comes to what I do and say? Sometimes you will be led to go against what others want, but it is still important to consider the costs. * What is my end goal? * Who or what will benefit? * Is the wake I leave leading people to or away from God? * When I leave a place, are people encouraged and affirmed or do they feel plowed over? Sometimes strong leaders leave a heavy wake. We can forget that others are not as energized as we are. We can help others move toward positive places in their lives or negative. A word aptly spoken is like apples of gold in setting of silver, Proverbs 25:11 says. We can leave a wake of encouragement, support, wisdom, and instruction. We can uplift, spur on, and be just what others need to affect their lives for good. Or we can leave a wake of brokenness and conflict. 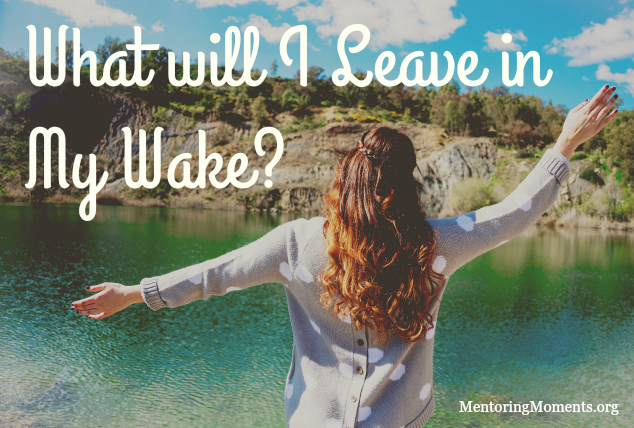 I guess the real question is: what will I leave in my wake? It’s a great question to ponder whether we lead or follow. Wow, Page! This is so convicting! My family calls me “the whirling dervish” because i am constantly in motion, trying to be helpful to do the right things, but can easily leave inattentiveness or impatience in my wake. I so want to leave a peaceful, calm, ripple after I have been with folks, rather than a high-speed rooster tail swirling behind me! Thank you for this challenge!